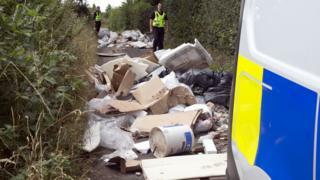 A country road was blocked with piles of rubbish dumped by fly-tippers. Cement, gravel, paint, plasterboard and plastic bags full of rubbish were dumped in Hyde Lane, Bedmond, near Hemel Hempstead, in Hertfordshire. Police were alerted to the waste at about 11:20 BST. They are liaising with Three Rivers District Council over its removal. Sgt Chris Simmons said fly-tipping is taken "very seriously" and clean-up operations come at a "great expense". Police diverted traffic while the rubbish was moved out of the way.